Berni. You lost your previous discussion, now you try to have a jab on me... very mature. I will just ignore you. I was just pointing out that what you said was nonsense and with your response you validated it. And im not here to win or loose discussions, but at least i have the common sense to admit i made a mistake instead of changing the topic and run. I didn't change the topic and run, I just read your comment as being a lame joke. How should I reply on it? There is no reply. I have no scientific proofs, I'm not a scientist to look for them. However you may check the previous page, look at the pictures I've posted and tell us how often do you see the first eye colour, and how many of people who has it have golden blond/dark blond/brown hair? It has nothing to do with how often i see this, there have been studies done on that. One must be naturally ultra blond (or oppositly - pure black hair) to have clear blue eyes. might seem right from a visagist point of view, scientifically it is simply wrong. Out of interest can I read about it somewhere? Not sure how I even ended up on this site.. but I must say... my mother and father both have clear blue eyes and naturally brunette hair with reddish tints in sunlight. My four sisters and I were all born with blue eyes as pictured in your textbook sample with no other colors in our eyes. 4 out of 5 of us have brunette hair. Only one has blonde. So, sorry zetigreek, I don't know where you got your fact from. Just to enhance the subject thread. Here is my Polish eye. When I was a little boy they used to call me "whitey" because my hair was platinum blonde. 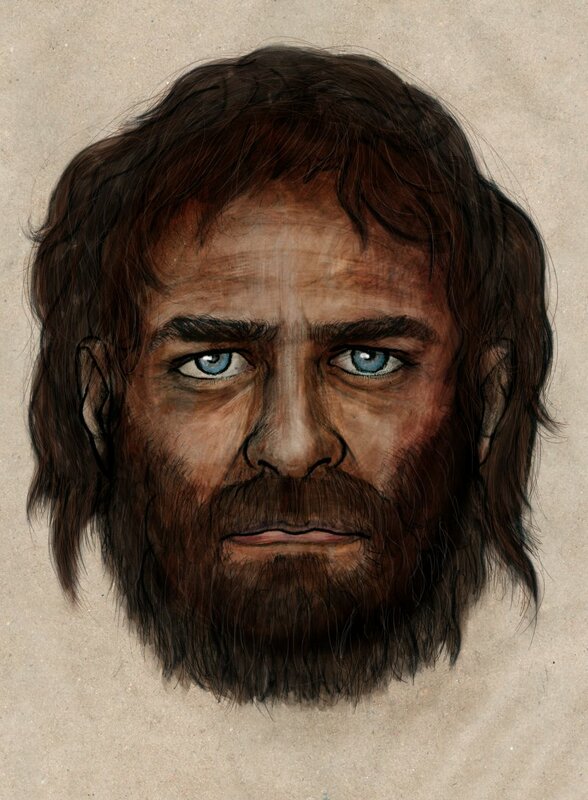 The other image is a construct from the dna analysis of a man found in a cave in Spain. La Brana man. I don't have ultra blonde hair, and my hair is golden blonde. My boyfriend, full Russian, has ash blonde hair and gray-blue eyes. Hi. Quick question. Is there anyone whose eyes are of different colour on this forum or maybe anyone who knows someone that's affected? I have Polish and have Amber eyes! There is more yellow in them than I see in Amber eye images that look more Amber golden orange, if that makes sense. I have a lot of yellow to make them glow. My father has similar but not as pronounced! All his polish brothers had very blue! I used to get teased as a child and called "yellow eyes", but now I get asked where can I get your contacts color? I just laugh and say you can't! Suffice to add, however, that a healthy majority of Poles have, at the very least, "light" eyes, shall we say:-) Blue, light amber, or green, I've occasionally met Poles with dark brown eyes (though never black! ), although they've maintained to me that they may be of Polish highlander aka góral origins, or possibly even Slovak. Eye colour alone, however, does scarcely a Pole make:-) Usually, the facial or bone structure (along with height) may indicate a particular nationality. I know for instance any number of Italians and Spaniards with lightish eyes, and yet their build, apparent hair texture/facial hair for men, and general stature show them to be Southerners. All of my Russian side has brown eyes as well as my Polish except my father's mother who had green. I know many many Poles with black eyes. I ain't no Kaszebe neither are them.
" the scientific consensus is that a lack of genetic diversity is the primary reason behind heterochromia. " the eyes are such a spectacular sight to behold & you get to see into the soul, i've studied why people have certiant types & where they come from (look up "haplogroup dna map" for something interesting). my eyes are mainly green with a deep blue ring around the outside & a small spot of brown in the middle. do you see heterochomia around much or is it pretty rare for you too? Most poles have brown eyes that's why no one in West considers them white. All blue whole family. Like glaring blue.